The 07:45 train from Szeged to Budapest made it’s way northward across the Hungarian plain through a chilly late October haze. A think blanket of cloud had covered the region two nights earlier producing the haze that was obscuring clear views beyond a few hundred feet. Arriving at the train station early, he had sat outside and had a cappuccino and observed the stream of people who poured out of the station as the 05:53 from Budapest arrived. With a full half hour before departure, he entered the station and located his train on the status board, he would leave from platform five. He made his way through the still quiet station and observed that the station master was a pretty blonde of no more than 30 years of age and taller than five feet. She walked with the due authority of her office having her well-fitting red hat sitting properly on top of her head, her medium length blond hair pulled back in a pony tail. Her authority showed as she carried out her duties. He had chosen a empty compartment near the back of the train and stood in the window observing the yard crew use the diesel engine move empty cars from one platform to another and passengers arrive, look in windows and decide which car to board. On the platform, standing five meters forward were four railroad employees, three of whom were in the dress of conductors. The younger of the crowd was evidently new. His uniform was crisper than usual and he wore a slight cap that our traveler had not seen before on a conductor. It was the informal type cap worn in the American military when in the casual uniform. He spoke with more youthful enthusiasm than his colleagues, but was seemingly welcomed into the conversation, clearly not quite his first day. When the time came for the train to leave, he moved to his post at the back of the train, closing carriage doors along the way. The station master had returned to platform five signaling that departure time was at hand. She stood in her place to receive the paperwork from our young man who engaged her in conversation, clearly she was more interested in an on time departure than chit-chat with the conductor. After a word from her, he walked up to the middle of the train to close a door and then back to his post, she was alternatively looking at her watch, the platform and the engineer, who awaited her signal that he was free to depart. Our young conductor boarded, she lifted her green sign, the brakes released and we were underway. Moments earlier, leaning on the window our traveler had noticed a family of three approach the door to the train car. The father lifted the large bag of, no doubt, freshly washed and folded clothing and prepared food while the mother gave instructions, hugged and kissed her son goodbye. The father then shook the son’s hand and the young man, no doubt returning to his university, boarded the train. He joined our traveler in the compartment, choosing the seat next to the door. He arranged his bags so as to be as out of the way as possible while keeping them on the floor. He immediately removed a notebook and began studying, this being exam season at the universities of the country. Other than the necessary greeting, no words were exchanged between the two men, one young, one old. Just as the train was about to pull out, our traveler noticed that he could see the tower of the monastery. Finding his camera, he took several shots, the winner of which to be decided later. Indeed, as he sat down, he began to look through all the pictures on the camera and smiled at photos taken the week earlier while visiting children’s homes in Ukraine, meeting with partners and friends in ministry and a couple of shots that his translator and friend had taken of him watching a choir from one of the homes practice for a presentation to be made the next for German donors. He also smiled as he thought back to the classes he taught in the high school where his translator taught English and German. He enjoyed the energy of the school, but after a couple of hours, was glad to be able to visit and no longer work all day around such energy as he had for sixteen years. 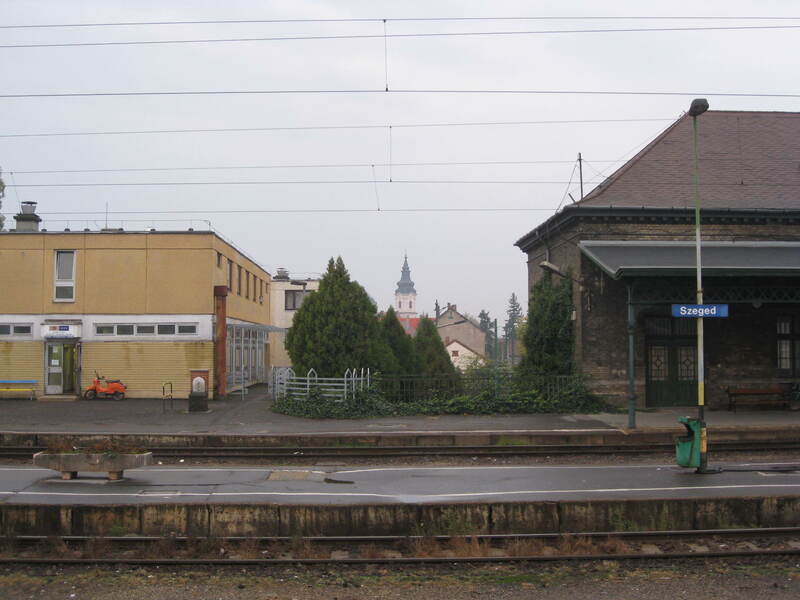 The train had now arrived in Budapest and had passed the lasted station before arriving at the terminus. As the train made it’s was to Nyugati he wondered if the engineer ever noticed the view at the beginning of the Nyugati yard of the dome of Parliament and further out the tower of St. Mattias church on Buda hill that could be seen to the left of the peak of Nyugatis train shed. To the right he could see the buildings along Vaci ut., where he would soon be sitting with coffee outside Starbucks while waiting for the hour until his continuing train north to Vac. As he stepped off the car, he realized his position at the back of the train put him in the position to go down through the underpass to coffee. He would remember this strategy for future returns to the capital city.